The high elves have long been the protectors of the Warhammer World, and their homeland of Ulthuan is known for the powerful magic that surrounds it. At the heart of Ulthuan lies a magical vortex, and the mages who created it remain trapped in a space out of time, endlessly working the spell that keeps the world from becoming a seething Realm of Chaos. When Ulthuan comes under attack from the forces of Chaos and dark elves led by the Witch King and the hag sorceress, Morathi, the high elves must hold firm or face disastrous consequences. In Defenders of Ulthuan Graham McNeill tells the epic tale of the struggle between good and evil. High Elves never really did it for me. An odd commentary for a novel I’ve written about them, I know, but it’s true. I just didn’t get what was interesting about them. They lived in perfect cities, had perfect lives and were good at everything they did. How dull was that? Of course, that was before I actually read their background, I mean really read it, and saw the rich complexity that lay beneath the superficial appearance. I read of the betrayals, the pride, the arrogance and the heroism that underpinned everything the High Elves did. Long ago, they were split by pride and arrogance, their society brought to the brink of annihilation and their once proud race doomed to a long, lingering death. Now that just sounds cool, doesn’t it? If anything, this just hammered home to me the value of taking the time to read things properly, as so many people (myself included) often read things or watch things or hear things and only take in what we want to read/watch/hear. So many times I see people writing on message boards about books – not just mine – and think, ‘…but that’s not what it says at all. If you read it properly, it says something completely different.’ Not that that’s got much of anything to do with this novel, it’s just something that came to me as I realised my mistake with the High Elves. Having already written one elf novel, Guardians of the Forest, I was already finding myself with a newfound respect and love for the elven background of the Warhammer World. The idea of an Elven trilogy began to form, with a novel each for the Wood, High and Dark Elves. 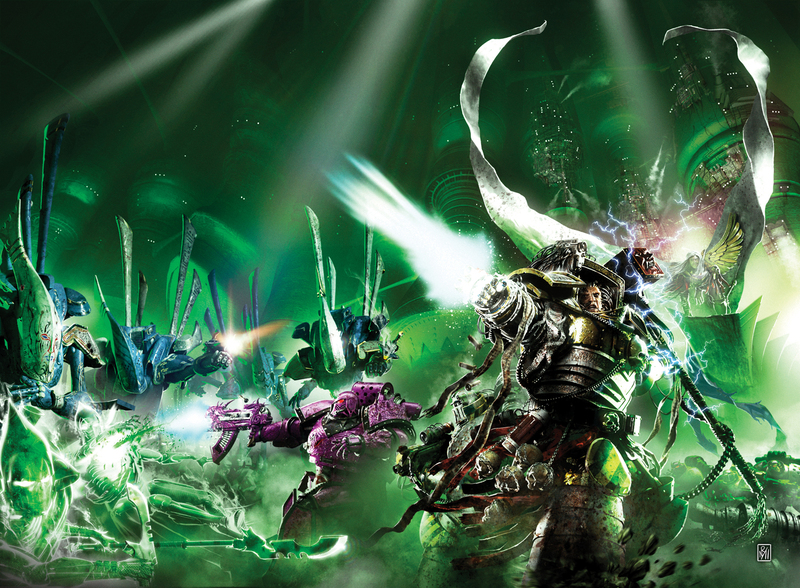 Of course, now that Defenders of Ulthuan is a two-hander, the idea of three books seems a bit shot down, but the concept remains intact. So, armed with this new respect for the High Elves, I decided it would be kind of fun to tell a story based on the inhabitants of Ulthuan. I’d done a short story about two High Elven brothers for the Black Library short story anthology, ‘The Cold Hand of Betrayal’, which I was pretty pleased with and had enjoyed writing. I’d left myself the option of going back to this story if I felt like it, perhaps realising that I wasn’t done with these characters – or they weren’t done with me. The story of Eldain, Caelir and the elf maid Rhianna, was one I felt had legs to go on some more. As it turned out I was right (though you don’t need to have read this story before jumping into the novel). When I began to develop the plot of this novel, I knew it had to be epic and have lots of big battles, but also had to have characters we cared about and wanted to see triumph, not just cardboard cut-outs to shout battle cries. I knew that a story like that couldn’t be jump started, it needed to take the time to build the land and the characters before plunging them into war. Thus, this novel is the first of two books set on the fair isle of Ulthuan. I think any of the Warhammer races, whenever they appear in print for the first time in a novel, should be as archetypal as possible, so I planned out how to show the High Elves in all the glory of their shimmering host, but also to explore their melancholy. Of course this meant pitting them against their ancient kin-foes of the Dark Elves, but that was all good too, as I loved the silken, razor-edged darkness of the Druchii. They make perfect foils for the noble High Elves, and are great fun to write. As the plot began to develop, it was clear that it was something big and that some of the more famous characters needed to be included. I didn’t want the book to read like a who’s who of Ulthuan, but the events I was telling were so important to the isle of the elves that it would have been difficult to justify why they weren’t there. So, take a bow Teclis, Tyrion, Eltharion and the Everqueen. There’s more, but I wouldn’t want to spoil the surprises I have in store for the next book, Sons of Ellyrion. I loved writing this novel, as it just seemed to flow from my head and onto the keyboard. I loved the journeys the characters took and loved exploring such a beautiful land with them. And, yeah, I felt sad when bad things happened to them, but let’s not go down that road just yet, as I don’t want you picking up the book thinking it’s all gloom and doom. Far from it. Inside, you’ll find magic, heroism, nobility, courage and honour. But more than that, you’ll find terror, battle and betrayal. All the great ingredients of adventure.